You will find a great different between the quality of a carpet cleaning service using several measurements. First, carpet cleaning that is done correctly should last you for at least 3-4 months. Of course much of it really depends on the quality of the carpet and previous condition. However, we often get carpet cleaning calls to make up for a previous job from 3 weeks prior. The key for a good carpet cleaning is composed of 3 main aspects. Carpet cleaning products that are right for the job and potent enough. Agitation with the right tools and application in order not to ruin the carpet. The correct level of heat at the end of the wand that will break the compound of the stain and the treatment. It takes years of experience to achieve the knowledge for the right application of all 3 aspects of carpet cleaning. We strongly recommend to look for a carpet cleaning company that will use biodegradable products. You might be familiar with the feeling of gunky residue on your carpet after you have cleaned your carpet. This residue is not only not pleasant to touch but also dangerous. When you have sitting residue on your carpet that with time sinks to the pad, it grows bacteria. Therefore, applying the right products and the correct amount is vital for the success of a carpet cleaning job. We use the best products in the industry in order to give you the best experience. In Addition, our goal is to make sure that your carpet stays clean for a longer time. Also, we do our best to keep the condition of your carpet at its best. Therefore, saving you money in the long run. Please do not attempt to clean your carpet by yourself. By using the wrong products and the wrong equipment you will damage you carpet. In addition, over time your carpet will accumulate wear and tear much faster. Please contact us for more information about same day carpet care services. Los Angeles and Orange County are such tough markets for carpet cleaning services. There are so many companies to choose from. In addition, if you ever scheduled a carpet cleaning before, then you must be familiar with all the errors that may occur. In some cases we are sure you even found yourself sitting around waiting all day and no one has showed up. Therefore, we give a 2 hour window for our customers and we stick to it. We appreciate and respect your time. In addition, we do not over stay our project as we know the right amount of work that should be applied. We do our best to avoid hurting your carpet, however, giving it the best treatment. However, the biggest concern of customers about carpet cleaning is the experience and knowledge. Not every carpet cleaning service is similar to another. Some companies choose the best equipment and use strict protocols. While other companies do it as a side income, and in most cases it shows. Here we would like to take this opportunity to offer you the top rated carpet cleaning service in Orange County. In addition, we would like to recommend to you a leading carpet cleaning service in Los Angeles with great reviews. You will find a great difference between the quality of a carpet cleaning service using several measurements. First, carpet cleaning that is done correctly should last you for at least 3-4 months. Of course much of it really depends on the quality of the carpet and previous condition. However, we often get carpet cleaning calls to make up for a previous job from 3 weeks prior. The key for a good carpet cleaning is composed of 3 main aspects. It takes years of experience to achieve the knowledge for the right application of all 3 aspects of carpet cleaning. The difference in results is incomparable. Having the right knowledge of how to penetrate deep into the carpet and onto the pad without hurting it is priceless. This could earn many more years of usage to your carpet, and therefore, save you a lot of money. Also, knowledge is not everything that determines the quality of the job. 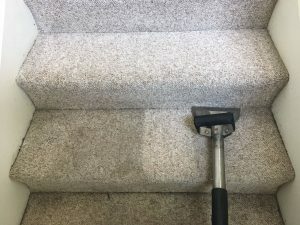 Yet another major part of how your carpet will end up looking is the equipment. Being able to reach the right temperature while achieving a satisfactory level of pressure and suction is second to non. We strongly recommend to look for a green carpet cleaning service that will use biodegradable products. You might be familiar with the feeling of gunky residue on your carpet after you have cleaned your carpet. This residue is not only not pleasant to touch but also dangerous. When you have sitting residue on your carpet that with time sinks to the pad, it grows bacteria. Therefore, applying the right products and the correct amount is vital for the success of a carpet cleaning job. We use the best products in the industry in order to give you the best experience. In Addition, our goal is to make sure that your carpet stays clean for a longer time. Also, we do our best to keep the condition of your carpet at its best. Therefore, saving you money in the long run. Please do not attempt to clean your carpet by yourself. By using the wrong products and the wrong equipment you will damage you carpet. In addition, over time your carpet will accumulate wear and tear much faster. We understand your needs as we have proudly served Los Angeles and Orange County for over 10 years. Leave it to us to do the dirty work for you. Please contact us for more information about same day carpet care services.